MANHATTAN, Kan. — “How big is your farm?” “It’s about 4-by-8.” “Oh, 4-by-8 acres? “No, 4-by-8 feet.” That imaginary conversation sounds like an unlikely discussion between Kansas farmers, but it illustrates how one young couple got their start in urban farming. They started raising microgreens on a 4-by-8 sheet of plywood. Now this innovative young couple is expanding their operation to provide local food while serving their community. Adam and Maggie Pounds are the founders of Simple Abundance Farm in South Hutchinson, Kansas. Adam grew up at Hutchinson and went to Wichita State. Maggie went to high school at the nearby rural community of Buhler, population 1,289 people. Now, that’s rural. She went on to Bethel College. Adam and Maggie met through friends and ultimately married. “We caught the travel bug,” Adam said. They worked a summer at Estes Park and then in Key West, Florida doing eco-tourism. Adam and Maggie are also talented musicians, playing guitar and multiple folk instruments. “Maggie sings like an angel,” Adam said. In winter 2014, they started growing microgreens in South Hutchinson. “Our whole farm consisted of a 4×8 sheet of plywood,” Adam said. Seeds were planted in compost on trays. Plants were harvested very young. “Microgreens are tender, nutty, and tasty,” Adam said. They now have a high tunnel for additional vegetable production. They produce sunflowers, peas, radishes, arugula, spinach, salad greens, kale, and more. “We use natural and sustainable methods to produce high yields on a minimal amount of land while protecting the environment,” Adam said. “They’ve been an amazing addition to our Reno County Farmers Market,” said Pam Paulsen, K-State Research and Extension – Reno County horticulture agent. “We are huge advocates of farmers markets,” Adam said. They have also opened what they call the Farm Stand, which is a self-service market for their farm crops and other local products year-round. “Our customers get a key code so they can pick up products at their convenience,” Adam said. Meanwhile, they’re caring for their two-year old son Arlo. “We call him quality control, he’s out there in the dirt,” Adam said. Maggie is president of the newly-formed Central Kansas Young Farmers Coalition. She also recently lobbied for the farm bill with the National Young Farmers Coalition in Washington, D.C.
How big is your farm? This innovative young couple got a start on a 4-by-8 sheet of plywood. Now they are producing a wide variety of fresh and flavorful produce. 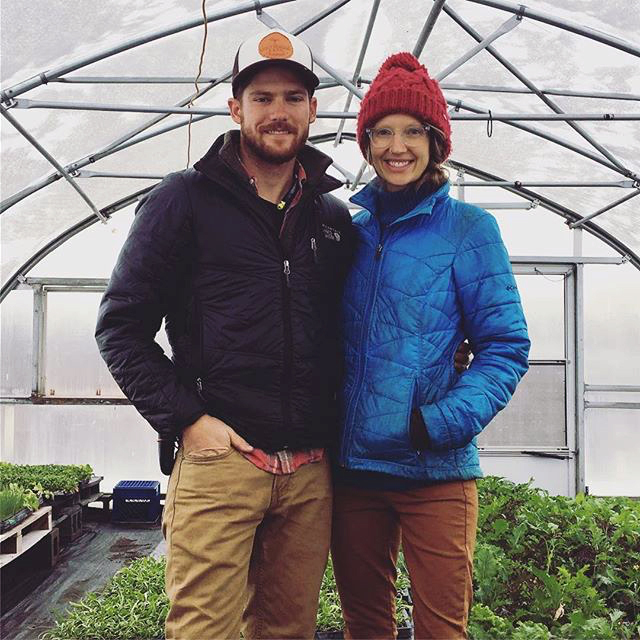 We salute Maggie and Adam Pounds – and Arlo too – for making a difference with their approach to urban agriculture. Their farm ground may be small, but their vision is tremendous.